Lock in a great price for Brogans Bar & Guesthouse – rated 8.4 by recent guests! Proximity to the Trim Castle. Band that night was fantastic. Rooms were clean. Staff were helpful. Breakfast was tasty. Centrally located. The price was good for a room in a suburb of Dublin. Loved the beauty of Ireland. People very friendly. Staff were beyond welcoming and made me feel at home. Love this place, it has such a warm charm about it. We (4 of us)were in Ireland for a week and we all agreed that our dinner meal in their restaurant was the best, their breakfast was pretty good too. The staff from the manager Mo, to the chef Lee, to the waiter Dan and of course Devon were all very friendly and accommodating. There was also surprisingly good music on our Sunday night stay. Trim is a lovely little town with a great big castle, that is not to be missed. The lady who checked us in was great. The room was attractive, clean and comfortable. The location is right in town, so it was convenient for our needs. The staff was friendly enough and the hotel was clean. They served some of the best hot wings I have ever had, at least once a week I think about those wings. Brogans Bar & Guesthouse This rating is a reflection of how the property compares to the industry standard when it comes to price, facilities and services available. It's based on a self-evaluation by the property. Use this rating to help choose your stay! Built from stone from the nearby Trim Castle, Brogan’s Hotel is in the heart of Trim. It offers rooms with power showers and O'Reilly's Gastro Pub. Guests can enjoy the property's live music entertainment on weekends. Rooms at Brogan’s Bar & Guest house all feature flat-screen TVs and internet access. Rooms are decorated in warm colors and include tea/coffee making facilities. Glebe,Trim and Headfort golf courses are all within a 15-minute drive of the hotel. 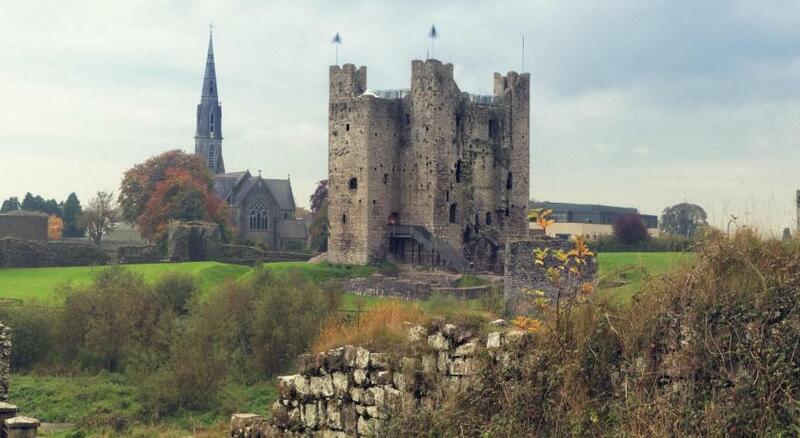 Well located for exploring the countryside, the Hill of Tara, the River Boyne and Bective Abbey are all closeby. When would you like to stay at Brogans Bar & Guesthouse? This room has a work desk, an private bathroom and tea/coffee making facilities. House Rules Brogans Bar & Guesthouse takes special requests – add in the next step! Brogans Bar &amp; Guesthouse accepts these cards and reserves the right to temporarily hold an amount prior to arrival. Brogans Bar & Guesthouse accepts these cards and reserves the right to temporarily hold an amount prior to arrival. The property hosts live music every Friday and Saturday night. Please note the rooms will be affected by noise. Please inform Brogans Bar & Guesthouse of your expected arrival time in advance. You can use the Special Requests box when booking, or contact the property directly using the contact details in your confirmation. First morning breakfast was great secind morning was a disaster burnt dry roasted as if had been sitting under a hot plate+50 minute wait couldnt re-order as was nearing check out time!! Fantastic staff and great tasting food. I stay every year. We stayed in room 2,twin room I sat on chair, chair broke, then went to use iron and was amazed and shocked that there was no socket, wires mangled into one, my friend I was with got an electric shock.. We did bring all things to the attention of a lovely lady who was on duty and asured us that all would be fixed. Very dissatisfied and dissatisfied as we stayed here lady mother's days and was 1000%. Beds not so comfy, our twin room was grand, we'll located as we were both smokers and just had to pop out the door for cigerette..
No cleaning service or replenishing of clean towels on second day & carpet in bedroom was soaking wet by the bathroom & my tights got soaked, which was a shame as I was ready to go to a wedding & didn’t have another pair. Lighting was very dim & I couldn’t open the blinds in the bedroom.